These boiled wool character slippers from Garnet Hill are a favorite every year, but the price is not my favorite. They are normally $44 a pair (yikes), but have been marked down to $33 until December 4th. Not at all a huge discount, but it's something. 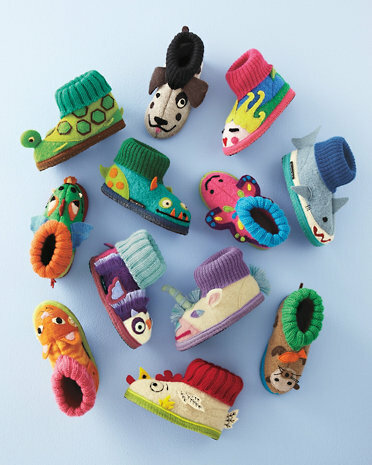 And they do make a really cute Christmas gift for chilly little toes; we received some of these last year and they are wonderful. Comfortable and super durable. Available in sizes 4 infant through 3 big kids. Update: Using coupon code J24BV4U1 gives you an additional 25% off the price of these slippers, making them $24.25 instead of the $33 I mentioned above. Thanks so much to my friend Natalie for the alert! Promotion code: J24BV4U1 (from retailmenot) gets you an additional 20% off plus free shipping, making them only $24.00. Fantastic! Thanks so much for this... I am going to include it in the post. Very much appreciated! It's actually an additional 25%, not 20. I wrote that too fast. Hope you guys are doing well! I love, love, love your website! Even better!! I just updated the post with the coupon code. Many, many thanks and enjoy your weekend!